Friday August 12th 1892 The men finished stacking the oats today. I washed some in the forenoon and was busy with the dinner the rest of the time. I sewed all afternoon. Mother and Hattie were over. They had been down to Robinsons. Saturday August 13th 1892 I was busy with the work all forenoon. Father came over with a letter from Charlie and stayed all afternoon. I had a letter from Flora Culbertson too. I spent all the afternoon in town. Will drove for me. I got me a new hat and some other things. I sewed a little in the evening. Sunday August 14th 1892 Will and I went out to see Sadie this morning. We found a dreadful piece of road. Sadie was out to her sisters. I got dinner as soon as I got home. Early in the afternoon the folks came from town and with them Mort Briggs and a Mr Dunlap from Ohio. They had been to Denver. They stayed all night here. Monday August 15th 1892 I had a good deal of extra work to do this morning. Will started to take the boys to the valley but met George Stevens and they went with him. When Will came back he took me out to Marys a little while. I was sewing all the spare time I had all day. It was very warm. I wrote to Charlie & Vene in the afternoon. Tuesday August 16th 1892 I was busy sweeping in the back part of the house and cleaning up both kitchens in the forenoon. After dinner I wrote to Fanny and Flora Culbertson. I then sewed a little and cleaned the porches all the way around. Father & Mother were over a little while before night. Will and I were to town in the evening. 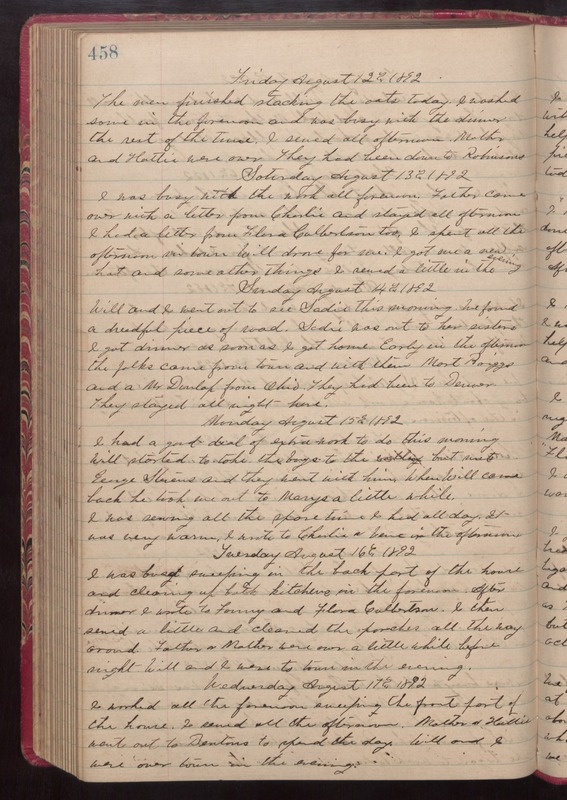 Wednesday August 17th 1892 I worked all the forenoon sweeping the front part of the house. I sewed all the afternoon. Mother & Hattie went out to Dentons to spend the day. Will and I were over town in the evening.